You probably noticed large flooded areas while gazing at the Louisiana countryside. That watery acreage may have been a rice field. 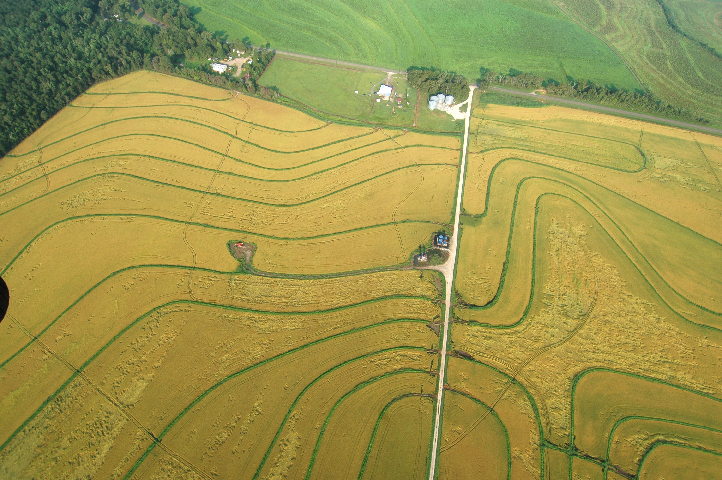 The aerial photo on the right shows how a series of levees is used to contain water. 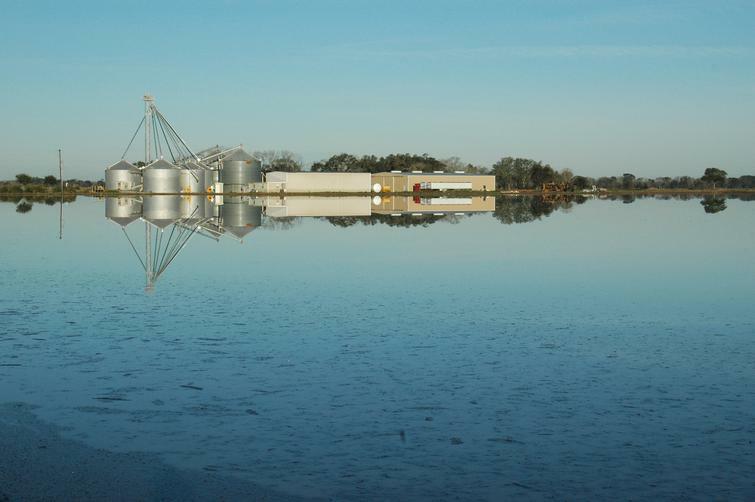 In Louisiana, most rice is grown in standing water. The primary purpose of flooding fields is weed control, however the types of rice grown here require flooding for other reasons as well. Water management is the single most critical factor in rice production rendering rice culture more complex than nearly every other crop. 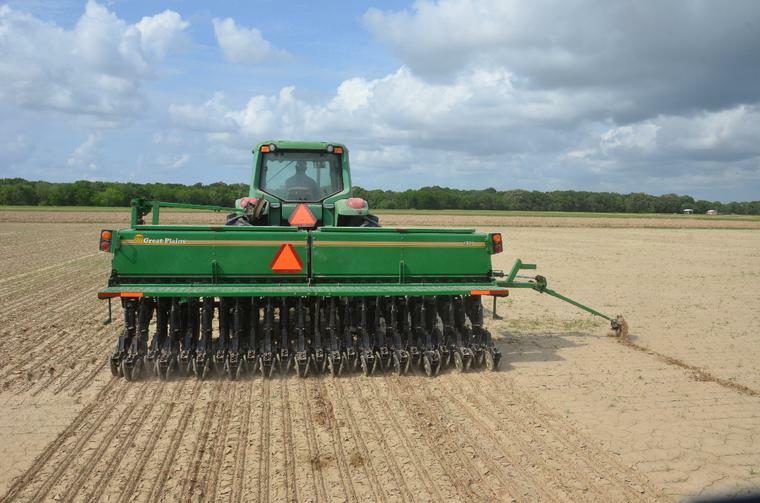 In Louisiana, rice is planted in the spring and early summer in dry or flooded fields. Rice is planted in the spring and early summer in either dry or flooded fields. Dry seeding is much the same as planting any grain crop. Seed is planted in the soil about an inch deep with a drill planter shown at left, which creates a channel for the seed, drops the seed, then covers it lightly with a layer of soil. 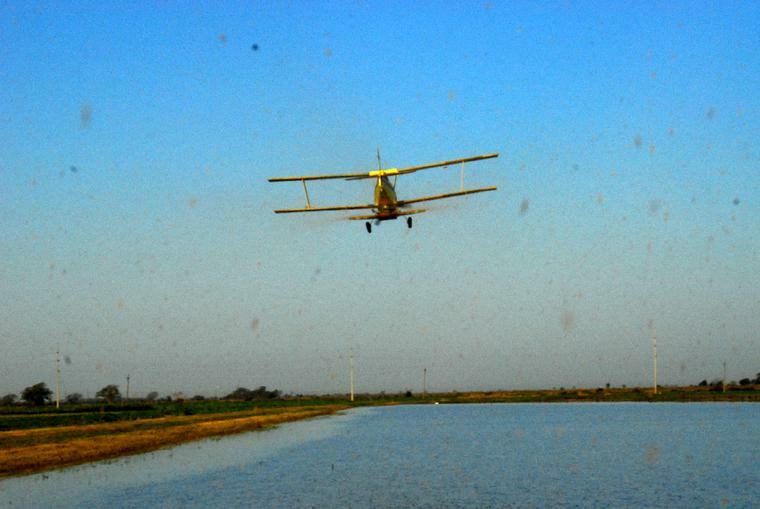 Fertilizer is applied by an airplane soon after the crop is planted. The red chunks shown here with small rice seedlings are fertilizer dropped onto a field that has been drill seeded. Next, the field of rice is flooded with a few inches of water. 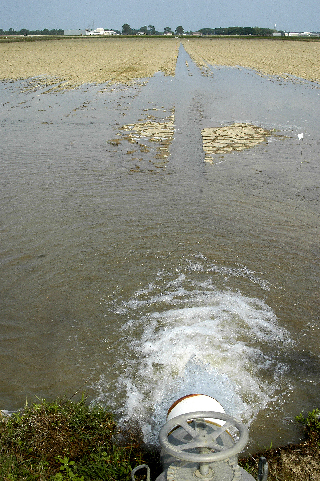 The flood is maintained throughout the growing season. Rainfall can help keep a flood at the proper level, otherwise farmers have to pump water onto the fields to compensate for evaporation. Pests are a major problem throughout the growing season. Insects, disease and weeds threaten the quantity and quality of the crop. The major insect pest is the rice water weevil. it lays eggs in the field and the young insects eat the rice roots. Disease such as blast and sheath bllight can diminish the crop. Weeds, such as barnyardgrass and sedges, are efficient at stealing nutrients from rice plants. 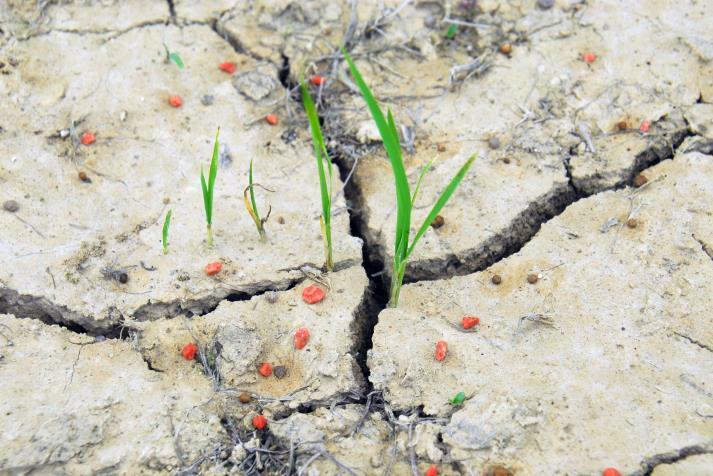 Also, a weedy form of rice, called red rice, causes numerous problems for farmers, including yield losses. About two weeks before the rice is at full maturity, water is drained from the field. 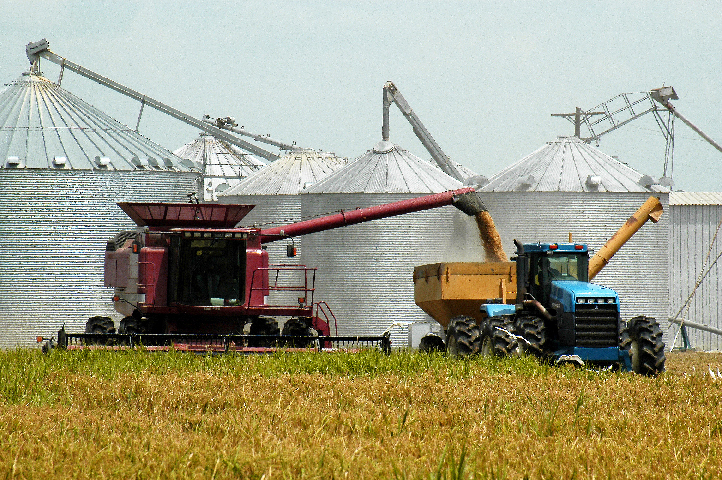 A combine is used to cut the rice. The rice can be stored in grain bins to be taken to the mill. At the mill, the rice hulls are removed.  If the bran layer is left on the rice, the resulting product is brown rice. White rice is obtained by removing the bran layer, and polishing the white grains.